BENTONVILLE (KFSM) — Students who walked out of class at Bentonville schools are serving detention this week, according to Leslee Wright with Bentonville schools. 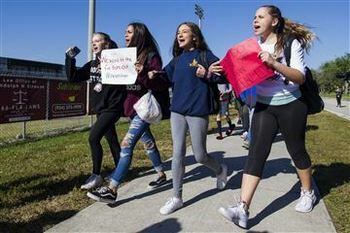 More than 600 students walked out of class on March 14 to advocate for stricter gun laws after the Parkland, Florida school shooting. Chris Riser, a social studies teacher at Ockley Green Middle School, reportedly conducted an unauthorized Black Lives Matter student walkout on February 9, KATU-TV reported. ... Some were from different schools, but many students started crowding around the building during our walkout," said Raiford.